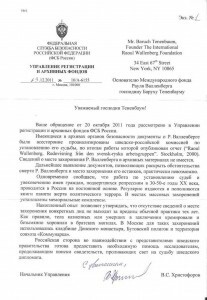 Your letter dated 20th October 2011 has been considered at the Department of Registration and Archives of FSB of Russia. 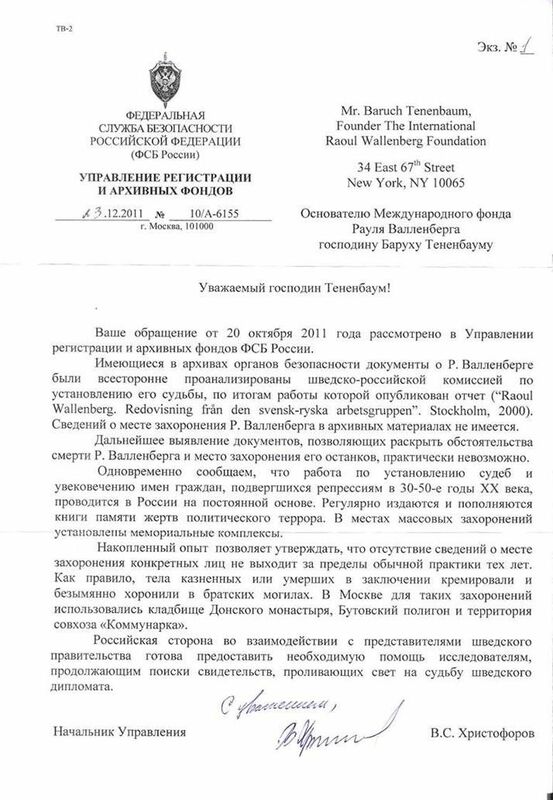 The documents which are kept at the archives of the security services regarding R. Wallenberg, were thoroughly analyzed by the Swedish-Russian Commission, and the report was published (“Raoul Wallanberg. Redovisning fran den swensk-ryska arbetsgruppen.” Stockholm, 2000). The archive materials have no information regarding the place of burial of R. Wallenberg. The further search for the documents which would allow to reveal the circumstances of R. Wallenberg’s death and the place of burial of his remains is practically impossible. At the same time we inform you that the work on establishing the fate and commemorating the names of the people who were purged in the 30-50’s in the 20th century, is conducted on permanent basis. Books for the memory of the victims of the political terror are constantly published and revised. Memorial monuments are erected at places of mass burials. The accumulated experience allows to claim that the absence of information about the place of burial of particular individuals is not beyond the normal practice in those years. As a rule, the bodies of those executed or who died in prison were cremated and buried without name in mass graves. In Moscow they used for such graves the cemetory of the Donskoy monastery, Butovo area, and the land of the soviet farm “Kommunarka”. The Russian side, in cooperation with the Swedish government, is ready to provide the necessary assistance to the researchers who carry on looking for evidence which would shed the light on the fate of the Swedish diplomat.